How to deal with feline eating problems. Among the most common complaints about cats is that they are picky eaters. 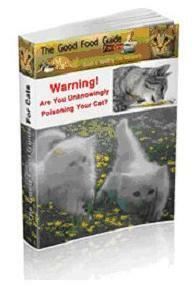 It certainly appears so in many cases, but perhaps cats are more attuned to what is not good for them. Dogs will eat about anything, but most cats won't do that unless they are starving. Still, it's difficult to out-guess a cat's preferences when it comes to food. A veterinarian once asked us, "So who's in charge here? You or the cat?" Admittedly, we usually let the cats decide. And you can't always make them eat what you have to offer anyway. We have seen cats starve themselves because we didn't get it right. Letting a cat starve in order to teach it a lesson can backfire, however, because it doesn't take long for some of them to deteriorate to the point of no return, and then die. What is the big deal about feeding them something they like? It's not like they are going to "grow up and leave home" and you have to prepare them for the cold cruel world. We also owe it to the cat to investigate matters to see if there is a medical problem. 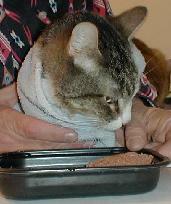 If a cat has dental problems, for example, he may not eat anything, even a favorite food. Our cat Petey (seen above) is old, has had bad teeth for years, and must eat very soft food. On some days even that hurts, as he has been seen crying as he eats, then runs away before he finishes. He begs for food, but then can't always eat it. He's had dental work, but he still has trouble, and he's become quite thin. We just love him and try harder. He seems happy most of the time and rests on his favorite window sill during the day. Finding good quality food is an important part of helping cats get the right nutrition so they don't have problems, and are less likely to be picky eaters. Those cheap, generic style foods often do not contain the optimum amounts or combinations of nutrients, and are best left on the shelf. As with humans, if the body's nutrition needs aren't met, the appetite is not satisfied. Also, one well known brand gives our cats diarrhea, so we avoid that one at all costs. Finding the right food can be tricky, but generally, starting out with, and then sticking with a higher quality cat food will help ensure the cat's health and her willingness to eat. Some cats do not like variety, so for them you need to find the right food, then stick with it. Another school of thought involves feeding only whole raw foods. Known as raw feeding, there are several good resources on the Internet for learning about this natural method of feeding your pets. There is strong argument for this diet, not the least of which is that animals were programmed by Nature to find their own food before "man" ever got involved. Further, many of our pets' ailments can often be traced to poor diet - designed by humans. Many owners have reported improved health of their pets when returned to their natural foods. 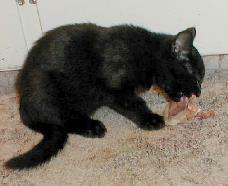 The kitten pictured has never eaten canned or dry commercial food. He already knows how to tear the meat off bones, gnaw on said bones (good source of calcium), and is growing quickly with no health problems. ©Copyright 2013 by The ProblemCat.com.